It seems to be a common retirement fantasy for people that can afford it to move to Italy, buy a vineyard and spend their older years producing wine. Personally, I don’t see the appeal. Like all forms of agriculture, making vine involves getting up early, physical labor, and, just to make things worse, doing all that in a warm climate. Besides, my budget is more aligned with buying a phone booth in Italy, and that wouldn’t make a very interesting game. But while I wouldn’t want to spend my retirement growing wine in Italy, spending a Sunday afternoon doing the same on a game board sounds much more attractive. That’s exactly what Jamey Stegmaier and Alan Stone let you do in Viticulture, a worker placement game that resulted from a very successful Kickstarter campaign. 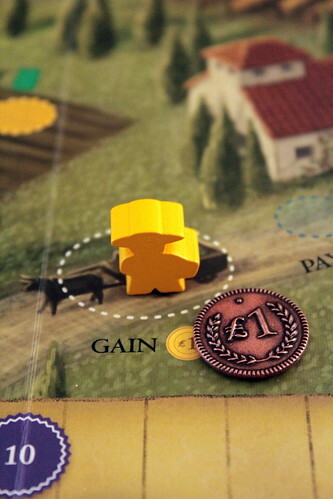 This review is of the second edition of Viticulture that has some small but effective changes from the first edition, the most important of which we’ll point out when we get to them. Viticulture is a traditional worker placement game, with different spaces to place your workers to take different actions, all of them with limited space for workers. Depending on the number of players, there are one, two or three spots per action, never enough for all the players. That was one of the big problems in first edition Viticulture, the space per action was so limited that some of our test players gave up in frustration. The second edition addresses that by giving every player one Grande Worker, a giant among meeples, who can go on actions that are already full with his diminutive brothers – I guess he’s just not in the union. He gives every player one chance to take an action they really need that round, no matter what else happens. But that power doesn’t come without a trade-off. Regular meeples can get a bonus if they are first on an action, often the option to take the same action again immediately or save some money paying for the action. The Grande Worker can never take that bonus, even if he does come first. And the fix works, our testers that previously walked away could really enjoy the game. It’s a simple change, but it effectively fixes a problem with the game. And with the Grande’s inability to use the bonuses, players always have to decide: do they keep him to make sure they get their action, or do they keep a regular worker to get the bonus but risk getting nothing. The fix even adds interesting decisions. Choosing which workers to keep is an important decision in Viticulture because, unlike most worker-placement games, not all actions are open at the same time. That’s because every round is one year with four seasons. Spring is a short one, all you do here is the especially unpleasant task of deciding how early you want to get up for the rest of the year. Getting up early lets you move early, but getting up later yields some nice bonuses: cards, money, and even an extra worker in this round. Summer is the first season to place workers, but they can only take summer actions. Summer ends when all players passed. Fall is another short season, all you do is draw Visitor Cards. Then, in winter, you take winter actions, but you don’t get any fresh workers, you can only use the ones left over from summer. That’s why you have to decide which workers to keep for winter. But the main thing in any worker placement game are the actions to place your workers on. So what can you actually do? Lets start with the summer actions. Some of them are very predictable for a game about making vine; you can draw Vine Cards to get different types of grapes in your hand. Different vines produce different qualities of red and white grapes when harvested. When you have the vines, the next natural step is to plant them. That’s another action, taking it lets you put a card from your hand on one of your three fields. Each field can hold multiple cards, as long as the total quality of the grapes doesn’t exceed six. The rest of wine production happens in winter, but you can do some other things in summer still. If you already harvested, you can sell grapes for some little money. You can also make money by giving a tour of your vineyard. You can improve your vineyard by building various structures. Some of them are required to plant the better wines, others give you an extra bonus when taking certain actions, and the two stages of expanding your cellar allows you to let wine mature to a higher quality. Finally, you can take an action to play Summer Visitors. Those guys are on another type of card and represent visitors coming to your vineyard that feel compelled to help you out in some way. So if you get an Architect staying for the summer, he’ll help you build a structure for three lira less than the regular price. A vendor lets you draw one card of each other type (Vines, Wine Orders and Winter Visitors) but also lets each other player draw a Summer Visitor. There are many more of them, with many different abilities. Using them well is a key skill in Viticulture, but they are also one place where bad luck can destroy your game. All of them are useful, but some more so in the early game or in the late game. If you only get them at the wrong time they won’t make you happy. Another frequent complaint about the first edition was that too many visitors were useless in the early game when players didn’t have the money to afford their services. That problem was addresses with the inclusion of uncertified visitors that do the same job as their regular counterparts, but take payment in victory points instead of money. It’s tough to lose five points in a game that ends when someone reaches twenty, but if those points buy you both structures needed to grow higher quality grapes, it might be a reasonable investment in your future. Winter is the same as summer again, but with a different selection of actions. Most importantly, you continue your wine production. The next step is harvesting grapes, that you may do on one of your fields with one action. When harvesting, you simply put tokens on the Crush Pad on your Player Board. If the field yields red grapes of quality two and white grapes of quality four – qualities of the same color are simply summed up, so the above might come from a total of six Vine Cards with quality one each – you put a token on the red two and the white four on the Crush Pad. Nothing happens with the Vine Cards in the field, they can be harvested again next year. Unlike real life, harvesting even makes sense when you won’t be able to make wine from the grapes this year. Grapes on the Crush Pad don’t rot until next year, they age just like wine would: at the end of the year, the quality of all grapes on the Pad improves by one. They even have the added advantage that grapes can mature to a maximum quality of nine with no trouble, to age your wine to the same quality you’d need a Large Cellar that doesn’t come cheap. So ignore realism, harvest some simple grapes early in the game and turn them into ridiculously good wine a few years later, when your cellar can take it. Actually making wine is the next and final step in production. When making wine, you take tokens from your Crush Pad and put them in your Cellar. To make red and white wine, you take one grape of the appropriate color and put a wine of the same quality in the Cellar. Blush wine is made using a red and a white grape token and creating a wine whose quality is the sum of the two grapes. Is that really how rosé is made??? Sparkling wine, the best you can make in this game, comes from combining one white and two red grapes and summing the quality of all three. The worst blush in Viticulture has a quality of four, so you can only make it with a Medium Cellar, sparkling wine has a minimum quality of 7 and requires a Large Cellar. All wines will age every year, improving in quality by one point provided that your Cellar is big enough to take the better quality. But you don’t just make wine to show off. Actually, I think that’s why most people who decide to retire on a vineyard do it, but you are trying to run a business here, so you want to make a profit at some point. You do that with Wine Orders, yet another type of card. A Wine Order is a contract to deliver specific types of wine with the right quality; one of your customers might order a blush of quality six and a white of quality four, for instance. You get Wine Orders by taking an action to draw them – a bit more of luck there, because you might get orders for expensive sparkling at the start and then only orders for the type of wine you get for free with your pizza delivery later in the game when you could make the good stuff. But managing your luck is part of the game. When you have a Wine Order, you can take another action to fulfill it, remove the wine from your Cellar and take the price: some victory points and an increase of your yearly income. You never earn money directly from selling wine, it always increases your income at the end of the year. A tad weird, but at least you get that money every year from now on, that’s not so bad! Also in winter, you can train additional workers for the low price of four lira. Having some more workers is a good thing, it’s always nice to be able to take more actions, but it’s not always the best strategy to buy all your workers. And then there are still Winter Visitors, who work exactly like Summer Visitors, only with more wintery actions and with the questionable taste of spending the rainy season on a vineyard. Those are a lot of different cards going around: Summer and Winter Visitors, Vines and Orders. You’re surely thinking, there has to be some element of managing those cards. And you’re right, at the end of each year you may not hold more than seven cards total, it doesn’t matter of what kind. Seven sounds a lot at the start, but you’ll find yourself discarding cards pretty quickly, and managing your hand is probably the second most important element in Viticulture, next to placing your workers. The game ends after someone reaches twenty points, which can happen very suddenly. The first few points usually trickle in one by one, but then I’ve seen more than one game ending with someone scoring seven or eight points in one round, around the ninety minute mark. A game really rarely lasts longer than the time frame promised on the package. And it’s a pretty intense 90 minutes, because Viticulture does all the right things for a good worker placement game. Your resources are limited, although you get more money than you need late in the game, you rarely have enough workers to do everything you want, and if you do there is not enough space on the actions to take them. That forces you to make many choices about what to do, when you do it and what has higher priority right now. 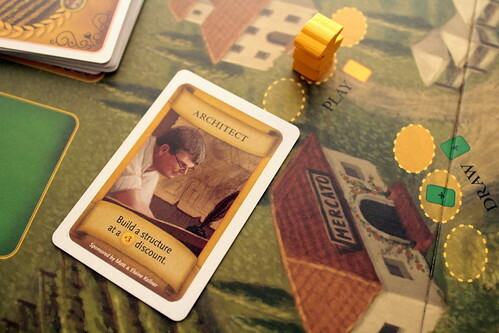 Viticulture doesn’t reinvent the worker placement genre, but maybe it doesn’t have to. 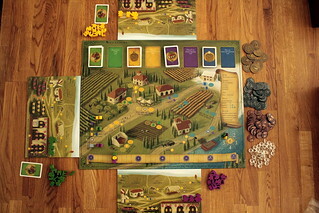 I enjoy games that invent completely new mechanics, but game like Viticulture, that take existing mechanics and just implement them very well, are just as important. Because sometimes I just think “I wish there was a new, great worker placement game”, and that’s what Viticulture delivers. 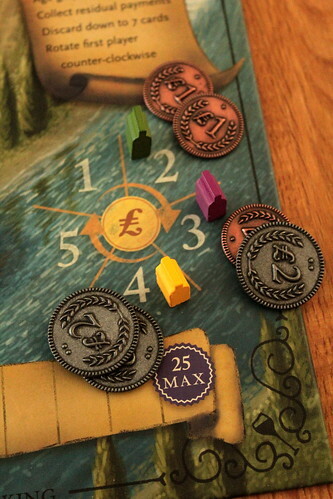 Note: The beautiful metal coins we used in the pictures come with the Tuscany expansion and are not part of the base game.